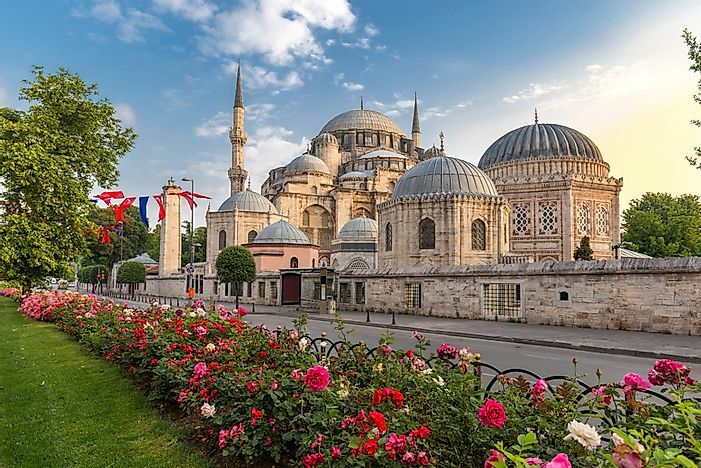 While Sunni Islam is the overwhelming majority religion in Turkey, there are other religions practiced in the country such as Christianity and Sunni Islam. A portion of the population is irreligious. Sehzade Mosque in Istanbul, Turkey. Turkey is a country covering parts of both Europe and Asia, with 97% of the country in Asia and the remaining 3% situated in Europe. The Bosphorus and Dardanelles Straits and the Sea of Marmara separate these two parts of Turkey. The country is a unitary state. It is the only Muslim country without the state religion. The other religions in the country are Christianity, Judaism, and Ashkenazi. The Islam religion can be divided into Sunni Islam, Alevi Shia Islam, Ja’fari Shia Islam and Alawi Shia Islam. The word Sunni comes from Arabic word sunnah, which refers to the actions and sayings of Muhammad as depicted in his hadiths (reports). Islam is the largest religion in the world with 80% of Muslims being Sunnis. They believe that Muhammad died without appointing a successor and therefore elders decided to appoint Abu Bakr as the first Caliph (successor). Abu Bakr was the father in law of Muhammad. The Sunni tradition places great emphasis on Muslim religious law (Sharia) as the standard for almost all societal issues, such as marriage, divorce, family matters, and even commerce. Sunni Islam is considered to be the religion of the majority in Turkey, which an estimated 65% of the population adhering. However, it is important to note that the Turkish government records Islam as the religion of those who are born to parents whose religion is not recorded. Therefore, there are many children of the irreligious and whose parents belong to religious minorities. Those who are classified as "other Islam" do not identify with any of the established branches of Islam. They make up around 13% of Turkey's population. In some countries such as Albania and Kyrgyzstan, unclassified Muslims make up the majority of the population. Agnostic or atheist Turks compose around 7% of the population. Compared to other countries around the world, the irreligious population in Turkey is relatively small. Quantifying the exact number of irreligious people in Turkey is difficult, as it falls outside of cultural norms. However, there has been an increase in the irreligious amongst Turkey's population, especially among young people. Similar to the aforementioned religious category, those who identify as "spiritual but not religious" make-up an estimated 6% of the Turkish population. Of the Shia Islam practiced in Turkey, there are estimated to be around 12 branches. Those who are called "Shia Islam" in Turkey would usually be referred to as "Aleviler Islam" elsewhere. The types of Shia Islam in Turkey besides Alevism include Ja'fari and Alawism. Other minority religions in Turkey and their estimated populations include Judaism (20,000), Tengrism (1,000), and Yazidism (500). Christian minorities in Turkey and their estimated populations include the Armenian Patriarchate of Constantinople (65,000), Latin Catholicism (20,000), the Syriac Orthodox Church (15,000), the Greek Orthodox Church of Antioch (10,000), Chaldean Catholicism (8,000), Ecumenical Patriarchate of Constantinople (5,000), the Syriac Catholic Church (2,000), and the Union of the Armenian Evangelical Churches in the Near East (1,500).